The 2019 American Silver Eagles are available with a wide range of product options. We carry the individual American Silver Eagle coins, rolls, coins in holders as well as the PCGS and NGC graded coins. 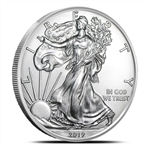 Brilliant Uncirculated 2019 Silver Eagle ships in a plastic flip. Perfect for placing in a Silver Eagle Coin Album. 2019 Silver Eagle Graded by PCGS as a MS69 coin with the West Point label. 2019 Silver Eagle Graded by NGC as a MS69 "Early Release" coin with the blue label. 2019 Silver Eagle Graded by PCGS as a MS69 coin with the Flag Frame. 2019 Silver Eagle Graded by PCGS as a MS69 coin with the First Day of Issue Flag Frame. 2019 Silver Eagle Graded by NGC as a MS70 "Early Release" coin with the blue label. 2019 Silver Eagle Graded by NGC as a MS70 coin with the ALS Black Core Early Release label. A roll of twenty unsearched, brilliant uncirculated 2019 American Silver Eagles. label.